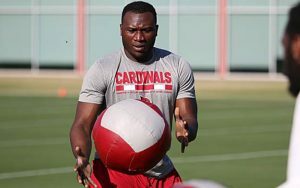 TEMPE – Moubarak Djeri did not take the conventional route to the NFL. In fact, the 6-foot-3, 275-pound defensive end had never played a down of high school or college football when the Arizona Cardinals signed him as a free agent. Now he is one of just three NFL players born or reared in Germany and one of just six to ever play in the league. Of the major professional sports leagues in the United States, the NFL has the lowest representation of foreign players, with just 1 in 39 born outside the country, according to a Washington Post analysis. Djeri was in his native country, Togo, Africa, when he first discovered American football. He saw a game on TV and was intrigued by the sport right away. Five years later, Djeri and his family moved to Cologne, Germany. While in Germany, Djeri started playing soccer, but quickly noticed he was significantly bigger and stronger than the other players on the field. “Whenever there was contact with another player, I always got a foul called against me. Eventually I realized soccer wasn’t the sport for me,” Djeri said in German. Years after first seeing American football on TV, he realized he lived only 5 minutes away from an American football facility. He was amazed to see how much equipment the players carried around. “You see pads, you see helmets, and that interested me more, but I didn’t know exactly who to talk to to start playing,” he said. The first people he discussed playing football with were his parents. They immediately shot down the idea due to the high injury risk associated with the sport. Still, even without his parents’ permission, he was eager to play, so his older brother suggested he try playing to see if he even liked it. His brother promised he would cover for him when he was at practice, and if their parents found out he was playing football, he gave Moubarak permission to tell them it was all his brother’s idea. The first day of practice only confirmed what he already knew: He loved football. “Since that first day of training, I knew I wanted to play in the NFL,” Djeri said. After four years of playing for the Cologne Crocodiles in the German Football League, Djeri received his chance to play in the NFL. Relationships helped the Cardinals discover the budding German Football League prospect. Cardinals scout Ryan Gold previously recruited German football players to play college football in the United States and built a relationship with the offensive coordinator of the Cologne Crocodiles, David Odenthal, years before working for the Cardinals. Significantly more work goes into scouting a player with less experience and less film, Gold said. “On the college level, especially at the bigger schools, you have a really good baseline of the competition,” he said. “In the German league, obviously it’s hard to be sure about the players they’re playing against, so more work, more film study, more background work and talking to the coaches is needed to paint a picture of who the player really is,” Gold said. At the tryout, Gold said defensive line coach Don Johnson really pushed Djeri. A player’s mentality, love of the game and athleticism are equally important to scout with less experienced players, Gold said. On the field, Gold said there is a big difference between the NFL and the GFL but Djeri is adjusting well. Teammates, coaches, his work ethic and passion for the game have continued to impress. Djeri recognizes the differences between the NFL and the GFL. 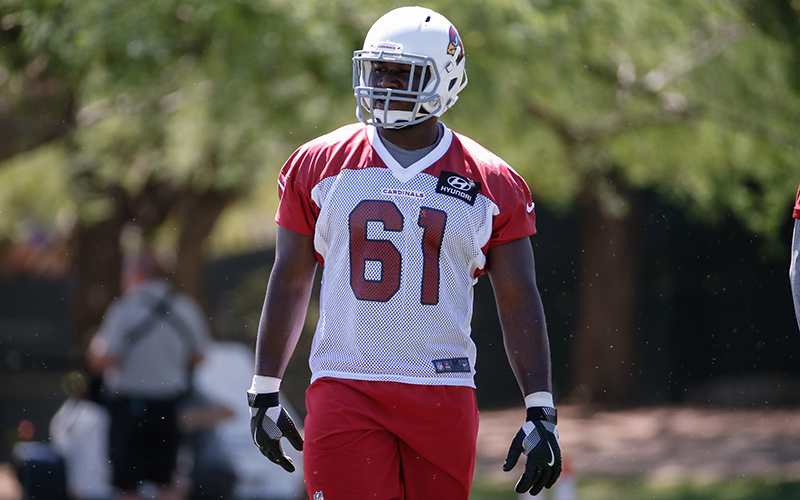 Off the field, Djeri is working equally as hard to adjust to life in Arizona. The heat is not an issue, he said, because it reminds him of his childhood in Togo, but he misses his family, especially his little brothers. In his limited free time, he swims at his hotel pool and studies the playbook as much as possible. Fans will have a chance to see Djeri when the Cardinals kick off training camp Saturday. The 53-man roster deadline is September 1.